I have the first part of these powerful words written out on the vintage green chalkboard hanging on a wall in our kitchen. There they sit, scribbled in dusty white chalk next to a few other helpful reminders to myself, such as “present over perfection” and “drink more water”. I value these words by Annie Dillard so much because I wholeheartedly believe rhythm and organization to be components of calm and contentment. Albeit nerdy, I happen to be from the proud camp of type A folk that thinks routine can be a wonderful thing. By mapping out and creating a “net” as Dillard calls it, for the day’s happenings, I for one am more capable of focusing on the task at hand without becoming too overwhelmed, a propensity hardwired into my personality as is. I have found that rhythm creates flow, which in turn, creates calm. It is the currant that flows the water this way and that, the strong force pushing the stream around the bend, making each stone smoother and rounder and less jagged as seasons transition from one to the next. When thinking about cleaning and caring for one’s home, especially with regard to deep cleaning routines, I think it’s fairly common to feel breathless before even beginning. Most often, it is not the work that we do that tires our minds and crowds our schedules, but rather the process of getting started and figuring out what rhythm is going to fit best within the structure of our days. We can spend a lot of time in our heads trying to problem solve or we can just start. I get it. There is always so much to do and so little time to do it, and then you throw kids into the mix and you may start to think, what’s the point? Why clean if it’s not going to last, for cleaning a home with kids running around is like shoveling snow in a blizzard. It can be a lot to take in, but if we never shoveled that snow, how do you suppose we’d be able to get out of the house when we needed to? Maintaining is a must and it can be simpler than you think. Let me help you find your rhythm by sharing with you what I do in our home on a daily and weekly basis. Cleaning and caring for our home, arguably the most important space of our lives, is an integral part of living in one. I believe it is one way we can better nurture our families and ourselves, and although it is relentless, it doesn’t have to exhaust us. It should, in fact, do the opposite! As we leave our mark on rooms by removing dirt and grime and by putting things in their place, we are rewarded with a sense of accomplishment and lightness, and thereby, we can better enjoy our time. When establishing a sense of order at home it is rather important to keep in mind that there is a good time and a poor time to deep clean. Should you get all your supplies out to scrub the wood floors while your kids are running around playing imaginary spaceship or are in the middle of a spaghetti supper? Probably not. Should you sanitize the bathrooms an hour before the weekend starts? Ew. No. You should, however, consider what your week looks like and carve out reasonable amount of time to do said scrubbing and other cleaning tasks. This will better help keep things in their place, what I call maintaining, and your home an inviting place that best reflects your mood and intentions. I think it’s also very important to discuss the impact one’s attitude can have on mundane and repetitive tasks such as scrubbing toilets. I don’t know that I’ve ever met anyone who enjoys scrubbing any part of the bathroom, but I do know people who can make that kind of work enjoyable by doing a few simple things before heading off to clean. Turn on uplifting or meditative music to get you in good spirits and create a thoughtful mood within your home. I’ve got a playlist here if you want some new inspiration. Make a refreshing drink to sip while you make the rounds from room to room. I like a large jar of water with slices of orange and fresh mint. Diffuse essential oils that help purify and clean the air. Lemon, rosemary, lemongrass, geranium, and clove are some examples of such oils. While you clean, move a few things around. Put flowers or yard clippings in vases throughout your home. Beautifying your space helps freshen it up and is very much a part of the cleaning process. It gives new life to a space and makes me happy. Last but not least, have the kids chip in. I’ll give Theodore (age 2.5) and Stella (age 5) a water spray bottle and some rags to help me wash the cupboards and the floor and the walls. Sometimes they actually end up getting the grime off which is lovely, but in most cases it’s just a fun way for them to feel like they are helping mama out which they love right now. I am going to take advantage of this while I can! Not too long ago I used to do my deep cleaning on Mondays. It being the day that started off a new, shiny week, it seemed like a reasonable time to sanitize the bathrooms and dust the floorboards. I love starting off our days together with a clean home and so most Mondays after my woman’s morning group I’d get to it, homemade solutions in hand, while the kids ether napped or played. Recently I’ve switched my deep cleaning day from Monday to Friday and I really love it. I also have days designated for other areas of the home such as washing, outdoors, windows and storage. When do you do your deep cleaning? When do you tend to things such as washing? All in one day? A little bit here and there as the week bounces on? 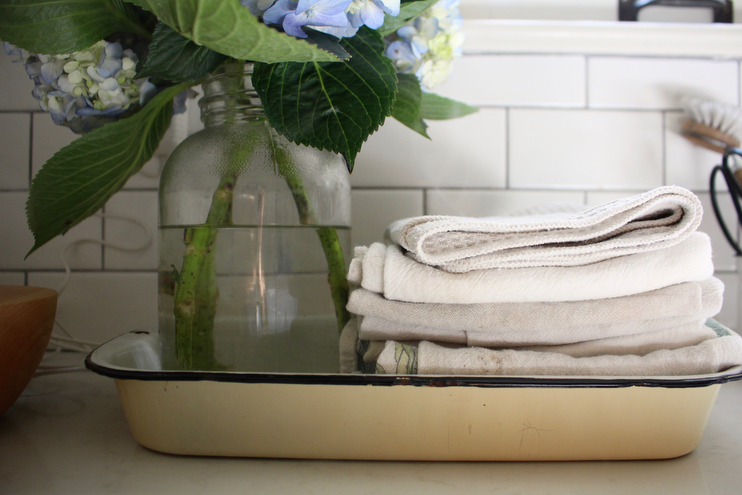 I am digging into what I’ve found to be the best method for deep cleaning and washing in the home, along with a few helpful tips to help make things a little more smoothly as you shine and scrub. Below I have outlined for you what I do daily and weekly, a balanced rhythm that works for our family in this season of life as I stay home with our little ones. I encourage you to feel free to take little bits (or all of it) to help you out! Daily: These are things I do every day to help maintain balance within our home. They are simple things that go a long way to help me out and they’ve become a part of our family’s rhythm. Make the beds. This is something we do upon waking. It helps set the tone for our day and instantly makes our bedrooms look fresh and clean without having to do any of the deep cleaning components. One load of laundry excluding bedding and stained clothing. I usually gather the dirty items upstairs and take them down in the morning. As a family of five there is always something to be washed. Staying on top of our clothing this way makes washing day much easier on Mondays, which is when I like to tend to bedding, blankets, stained clothing and other pieces outside of everyday wear. Wash dishes. Each night before bed we run the dishwasher if it needs it, and then in the morning when I am waiting for my kettle to steam I’ll unload it. Stella usually helps me by putting away silverware or gathering plates. If you don’t have a dishwasher, this is even more important because dirty dishes in the sink can add up fast! Sweep the main floor after meals. Dirty floors are a pet peeve of mine. I really dislike walking around on crumbs throughout the day so I sweep up messes after meals. Alfie is in the throwing his food stage, so that means a lot of sweeping right now, which is alright. I have a little dust pan near our kitchen nook that is in a handy spot for when I need it. Put items in their rightful place. Each item in your home should have a nice home of its own. We love baskets for this very purpose and several times a day the kids and I will work together to clean up our messes and put things back where they belong. Having them pick up their area before going to play elsewhere helps keep things somewhat tidy. Wipe down counters. This is also another one of my need to do things. 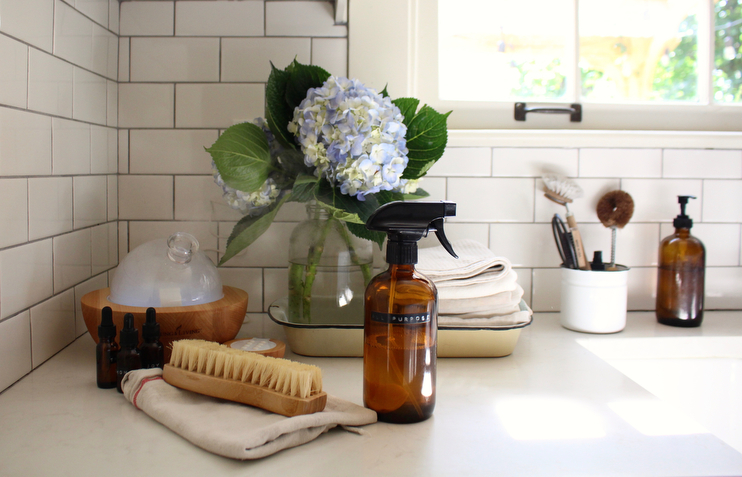 I don’t really care for a lot of items out on the counter tops because I prefer to keep things simple, and the same goes for keeping them clean as well. I wipe them down with my homemade all-purpose spray when I need to, just maintaining here and there without fussing too much about it. Again, not a fan of crumbs. Weekly: if something within this weekly rhythm is not in need of a good clean or tidy, move along my dears. You can get to it next week when it will most likely be ready for ya! Launder bedding, blankets, rugs and towels. Treat clothing with stains. I put our stained clothing in a separate bin so I don’t have to sort through them before washing each morning. I like to do all the stained clothing at once so the process goes more smoothly. Tuesday – Outdoor Chores – This changes seasonally. It’s currently summer and if the weather is nice we’ll use this day to pull weeds, water our flower beds, pick vegetables, mow the lawn and tend to the compost bin. Sweep the porch and blow off the patio. Clean out the car and tidy garage. Water plants, both indoor and out. Go through the various piles that have accumulated throughout and sort them out. Pick a few cupboards that are disheveled and clean them. Purge items you no longer use and rearrange. Choose ten items in your home that you haven’t used in one year and toss. Tidy items in drawers, closets and other storage areas. Get a handle on the crazy crafting area that has been used throughout the week. Take stock of pantry and other food items. Now is a good time to clean the fridge out and organize its contents. Our home has a hundreds of tiny window panes, which is my most favorite thing about our home and also a big pain in the bum, pun intended. I swear one of the kid’s favorite things to do is smudge them up right after I’ve wiped them clean and our front door always looks like someone took a handful or two of coconut oil to it. Since this is a rather large chore, I save the windows for one day apart from my deep cleaning on Friday. Sweep under the couch, beds, tables. Vacuum and mop floors top to bottom. I start up in the loft and work my way down. Dust surfaces in each room. Wipe down appliances in the kitchen and any yucky bits on the cupboards in the kitchen. Scrub and sanitize the bathroom as a whole, cleaning toilets, tubs, showers, sinks, mirrors and floors. I also start in the loft with this and work my down to the first level bathroom. Saturday & Sunday – Rest! 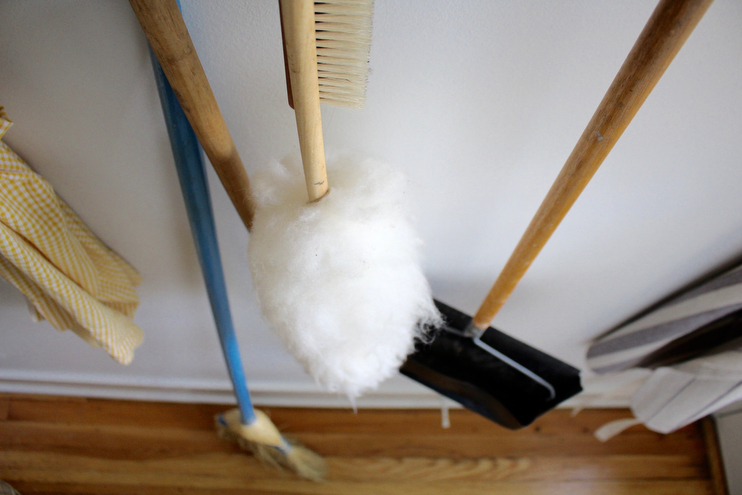 Seasonally: There are chores that you can do from season to season depending on the weather outside and what you’ll need to make things run smoothly at home. Such examples include: washing exterior windows, cleaning lights, washing pillows, donating big items, scrubbing and baseboards/walls etc. I am currently making a beautiful PDF to illustrate all of this, something you can print off and have on hand in your home. Being a fan of little checklists I am quite excited about this, so stay tuned! Having a rhythm is a good thing, but it should not bind you nor shame you. One should approach this rhythm, and any routine for that matter, with grace as each day gives us both things we expect and things we do not. Some days nothing on your list will get done, and that’s okay. Some weeks, what you’ve put in place will simply not do. Adjust. Rework. Relax. Don’t take any of this too seriously, because cleaning is not what living is all about. Cleaning and caring for your home is one way we can better enjoy our time spent with those we care about and with loved ones we do life with. When approaching the subject of cleaning and tidying, think of it as a way to care for and respect your environment, the place where you learn and love and grow. I believe as you practice your rhythm you will discover that not only it will become easier for you, but also, your soul will feel more satisfied, nourished, and enlivened by the freedom it gives you. cleaning is my jam, and lists are my JAAAAAM. and having an organized to do list throughout the week.. yeah.. that’s the Peanut Butter to my jam. For years I’ve used this cute little print out that I found on frenchpress morning’s website.. I love some of the differences in the two lists, and I love the idea of treating and washing all of the stained clothes at once. why have I never done this? Your routine is inspiring me to revisit mine and make adjustments! I love this so much!!! Especially your summary at the end about rhythm not binding or shaming us; water for my soul today. Can’t wait for the pdf! I can’t wait to see the pdf you’re making! I especially love your cleaning posts. I remember reading once you’re an infj, and I am also. I love that you add philosophy to cleaning. Such an infj thing to do, and it really speaks to the artistry of womanhood. Thank you for inspiring me to be a joyful stay-at-home mother. I’ve been struggling with being back at work as a new mom, and I’ve been longing for the conviction to embrace a role at home. You are awesome! qq — What are the proportions of your lavender linen/laundry spray? Drops to oil or water? I’m new to the oil scene! Can you please please please show how you mop and what mop you use? First, love your blog! I am the opposite of you and while I like making routines I am hard pressed to stick with them, I’m a very fly by the seat of my pants gal. Which of course has its positives but when it comes to my house, it’s either slick and span (the way l like it) or a goal disaster, which totally is totally debilitating and compounds the problem. But, that is for another conversation. I’m just wondering how you get everything done in one day on your Friday list- with 4 kids, none the less! It look like 3-4 days work for me… Or maybe I’m just terribly slow?! Any advice on how you manage you ur Friday’s and other kiddos would be appreciated! I love this, I was curious how you leave your stained clothes for one day. Do you just pretreat let it dry and wash it all at once? I love your cleaning routine. I also deep clean on Fridays, BUT I’m so crazy and do laundry on the same day! No wonder I’m exhausted by 5. I’ll definitely make some adjustments.I’d love to know when you fit in meal planning and food shopping. Oh man, if the PDF is made available, I will definitely use it! This is so helpful. I have to vacuum every other day (because two indoor cats…whyyyyyyy??). So…the vacuuming is going well, but I need to pick up my game in these other areas!